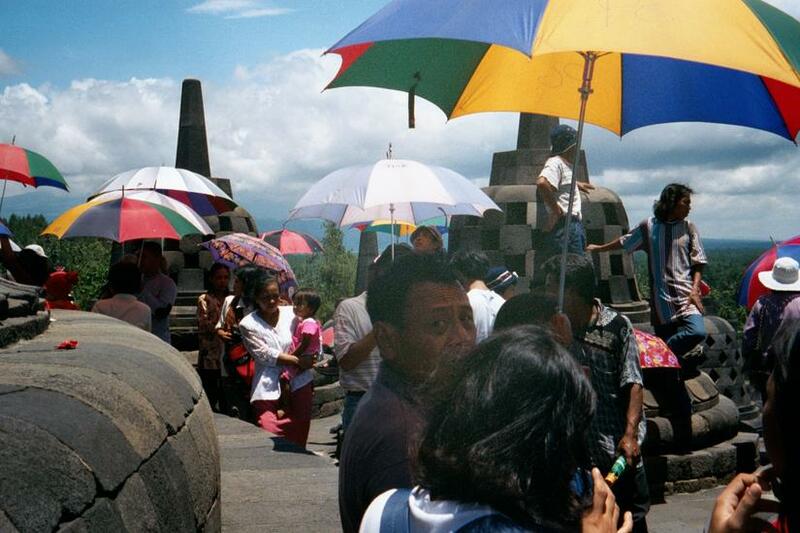 Borobudur is Java's greatest tourist attraction, appealing to a domestic audience as much as and perhaps even more than it does to the foreign one. 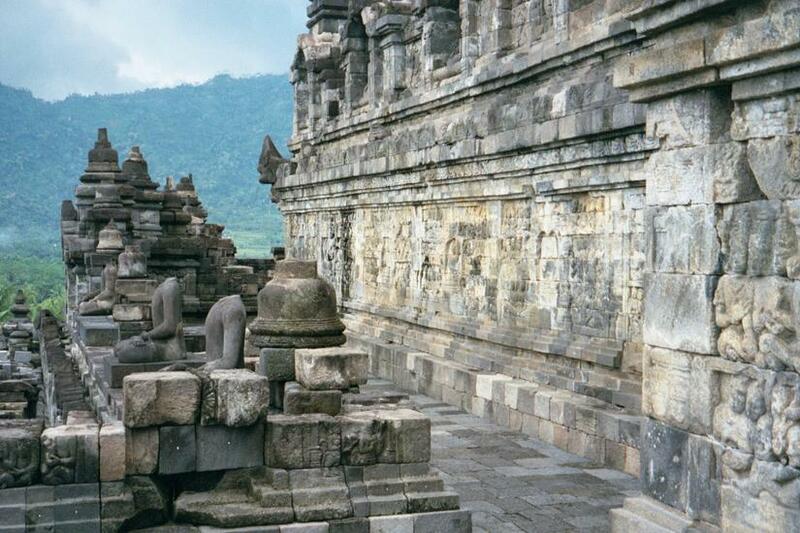 The domestic appeal has little to do with the purposes for which the monument was built: it has more to do with grounding Indonesian nationalism in distant antiquity. That's why the place is not only crowded but noisy and why at dusk, when the crowds go away, the guards chaff one another in a way they would not think of doing in a mosque. 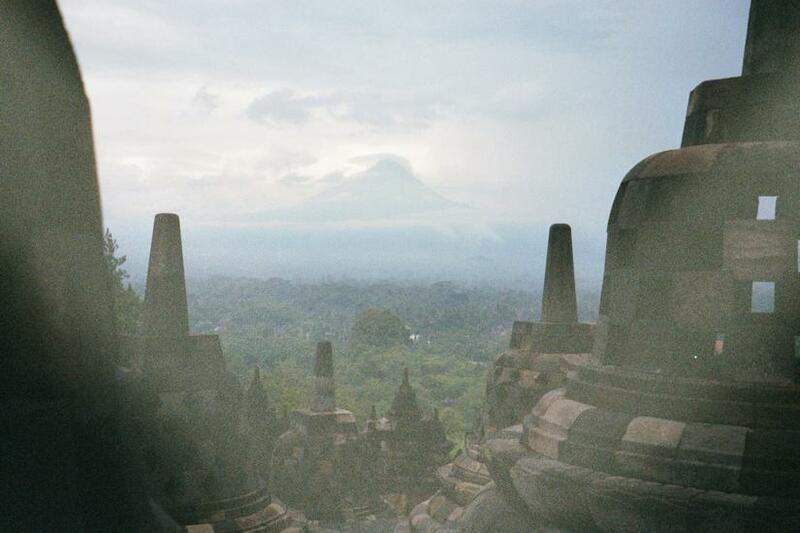 When Borobudur was completed about 830 A.D., however, it was a teaching vehicle for Buddhism, a place where pilgrims could wander for days or more, while seeking to learn what the stones taught without words. The stones still teach, if you have some time. 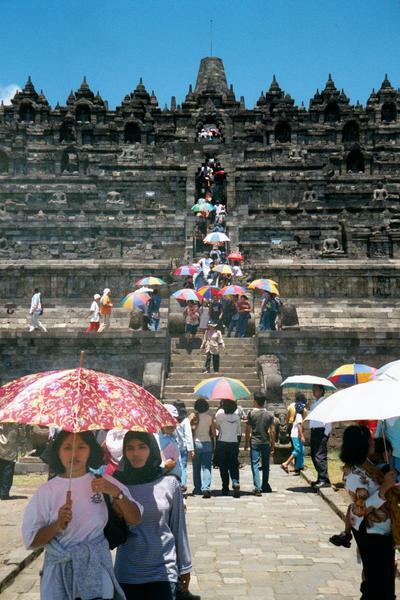 Borobudur is a four-sided pyramid, with four square platforms nested atop one another and topped by three near-circular ones. The east side, shown here, is the intended avenue of approach, but this fact can only be distinguished by finding the beginnings of the stories that are illustrated on the otherwise identical walls of the four sides. 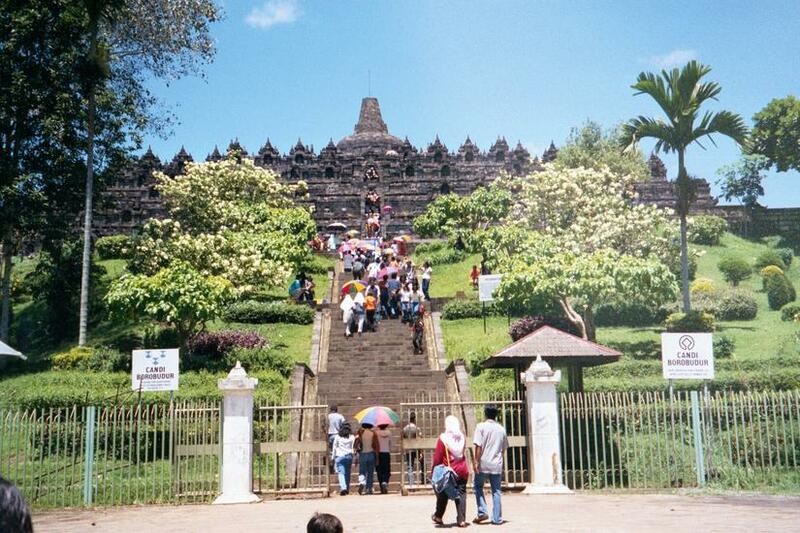 The summit pagoda was added by the Dutch and is perfunctory: the shape of the original cap is unknown. Mid-day, there's a scramble from bottom to top and back again. Most visitors don't spend a lot of time looking at the pictures on the rectangular terraces, which are unintelligible without a guide of some sort. Instead, visitors congregate on the round terraces up top, which are punctuated with perforated stone bells that shelter statues of the Buddha. 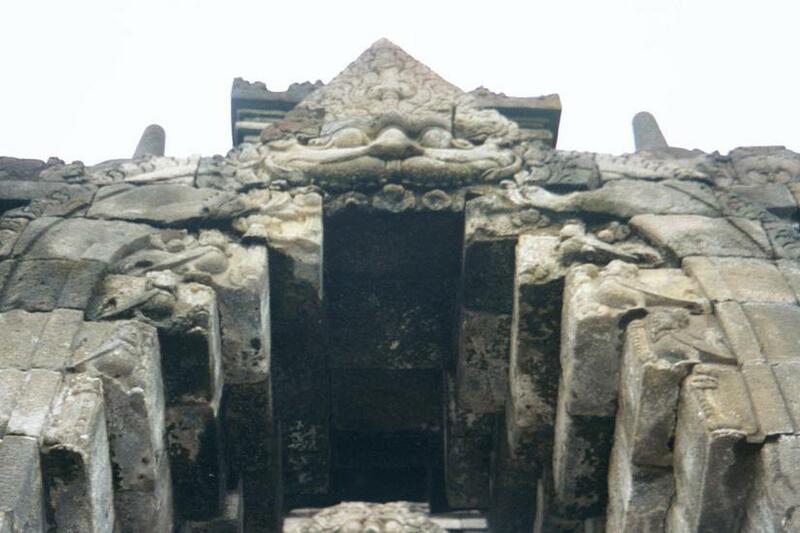 On the left, the base of the summit pagoda. 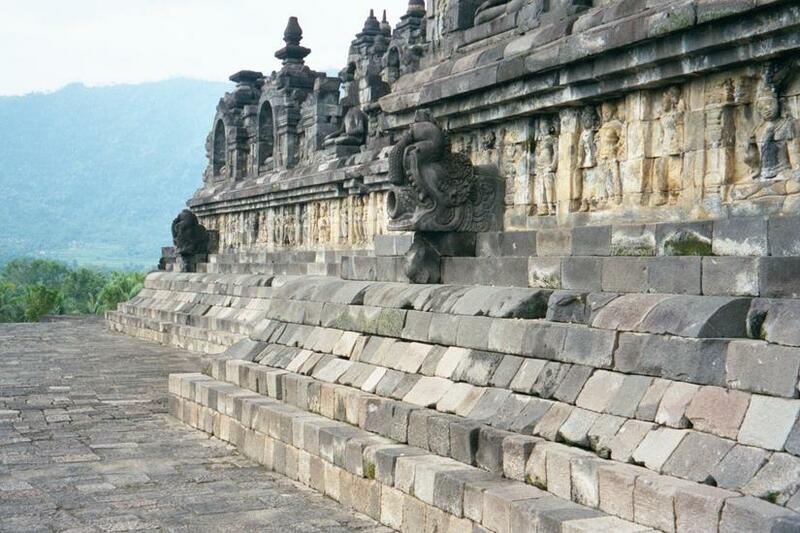 Early in the morning, you can escape the groups, not yet arrived from Yogyakarta. You can make out not only the summit pagoda but the set of terraces and the many Buddha images which sit quietly on each and look out as if from their own front porch. The stairs on all four sides are the same. The mass of the monument is not quite as great as it appears, because the edifice is on top of a natural hill. 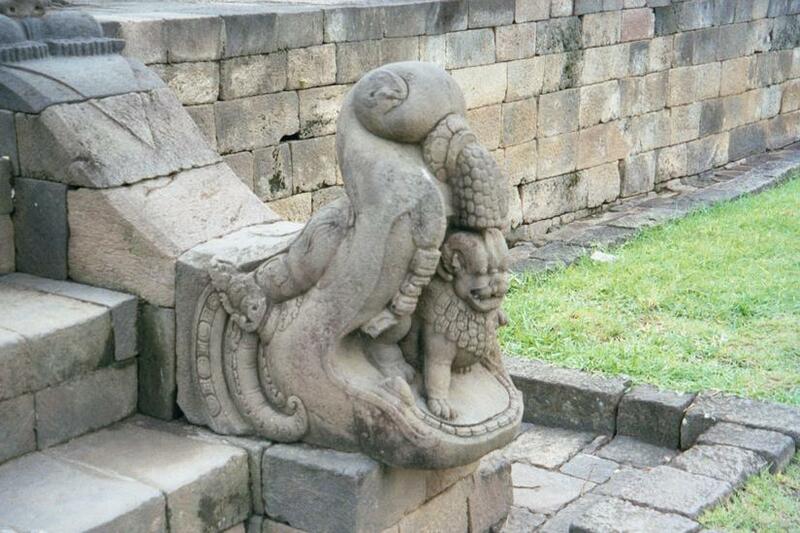 The stairs are decorated with makaras, mythical sea-monsters that disgorge other animals--in this case a lion. Climbing the stairs, you walk into the mouths of kalas, jawless creatures associated with immortality. 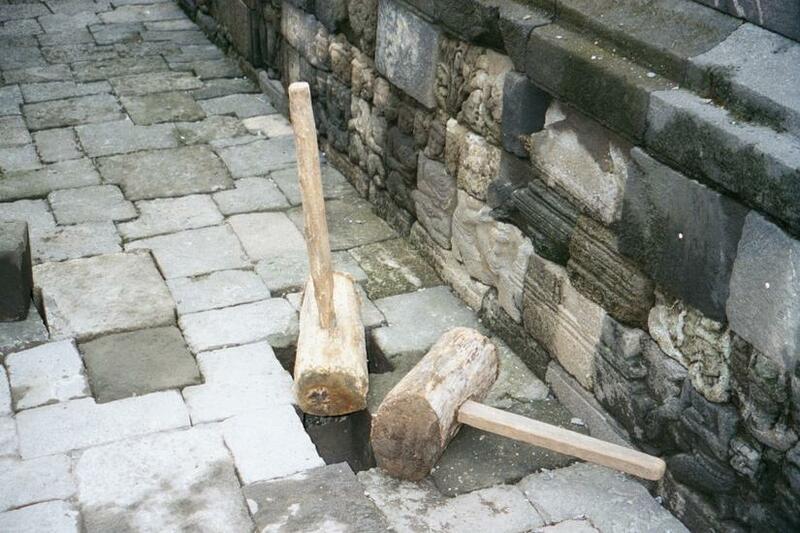 For more about them, see Cambodia: Angkor 8. Looking south from the base of the east side: sculpture fringes the outer balustrade of the first platform. The walkway around one of the square terraces. 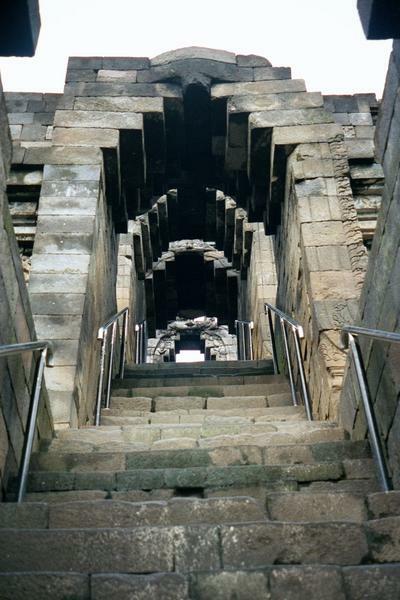 Both sides of all four levels are covered with reliefs, as well as lined by statues of the Buddha. All together, there are some 1,400 sculptured panels. They illustrate five Buddhist texts and range in subject matter from the worldly to the spiritual--the former at the base of the monument, the latter at the top. 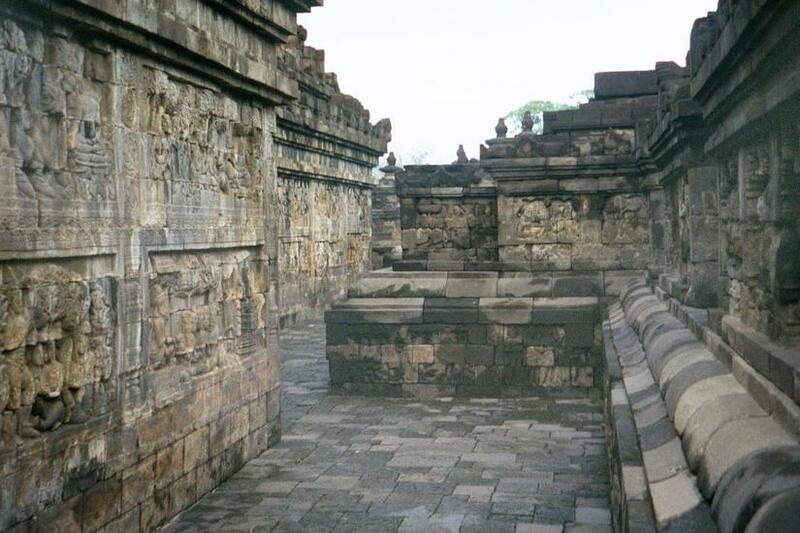 Rather than create long corridors, the paths around the terraces follow a zigzag layout. Pilgrims, who knew the stories the way we know movie stars, always circumambulated the terraces in a clockwise direction. That's the way in which the various narratives are laid out. Up top, the round terraces and their belled Buddhas remain mysterious. While it's reasonable to suppose that pilgrims understood the texts of the reliefs that covered the walls below, what they did up remains unknown. In the distance, to the east, Mt. 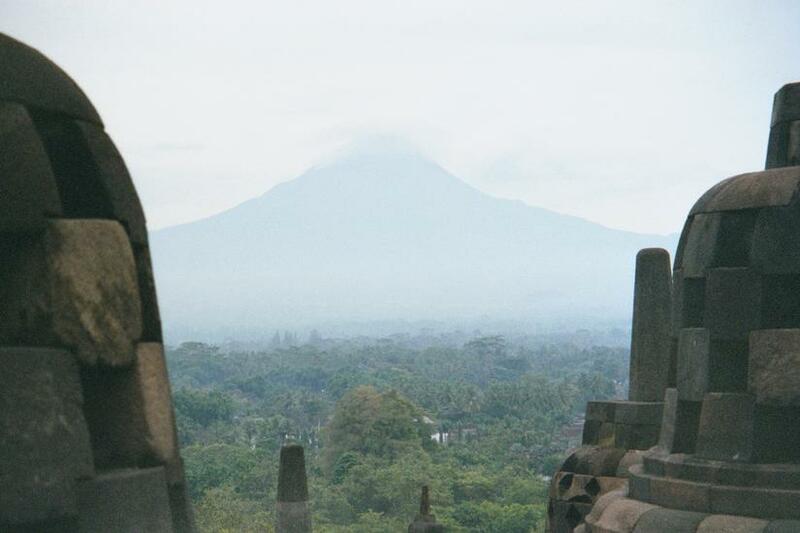 Merapi faintly emerges. The clouds change rapidly, and the mountain emerges more clearly. It's an active volcano. If you catch the Buddhas while you're in a responsive frame of mind, they radiate calm. Walking around the terraces, you can even suddenly feel that there's somebody next to you. 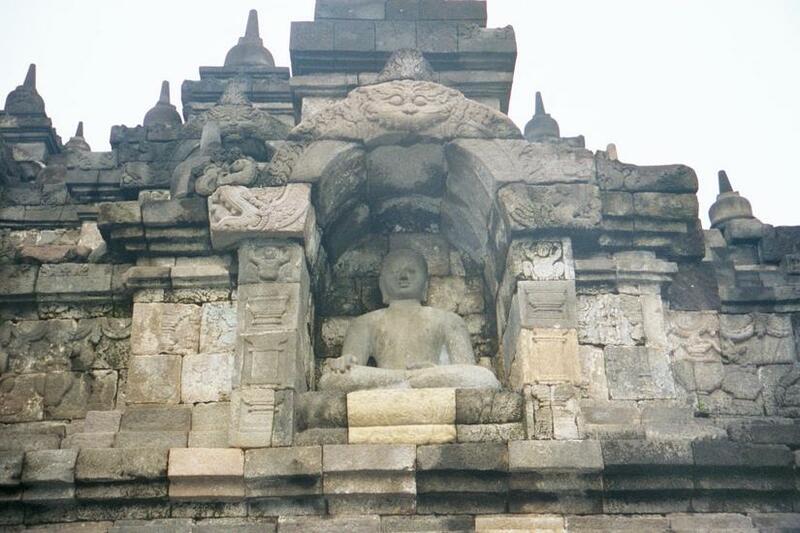 In this case, it's a Buddha in the dhyanamudra, signifying meditation. 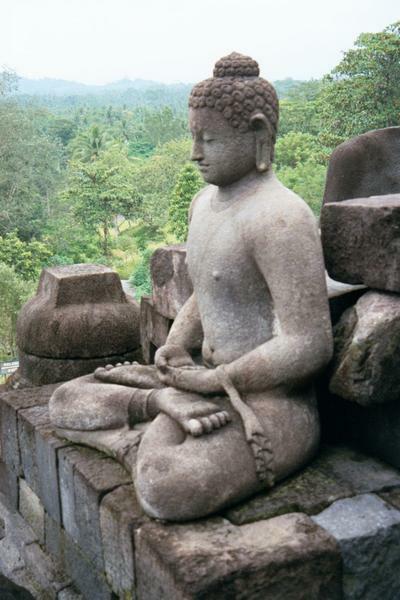 There are 503 other life-sized Buddhas at Borobudur; they are shown in a variety of positions. 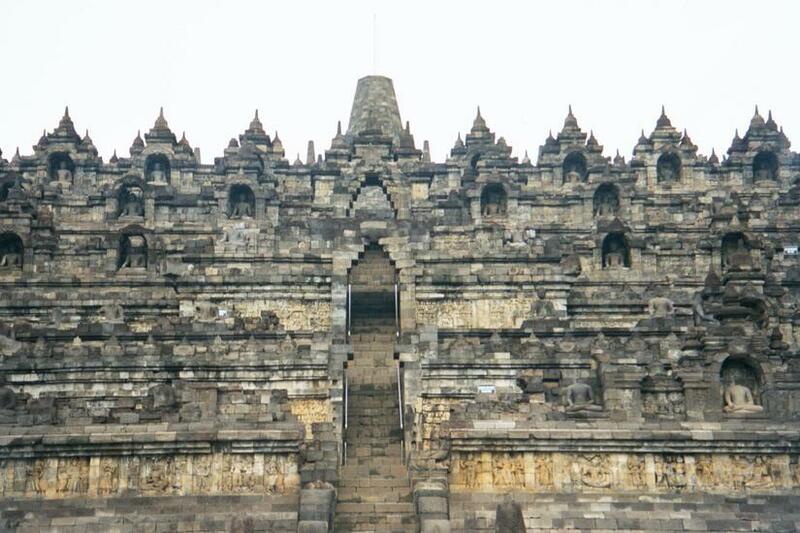 Rebuilt by the Dutch and again, more thoroughly, by the Indonesians, Borobudur still needs maintenance. New andesite blocks are still stockpiled and occasionally added to the million or so that are already set in place.